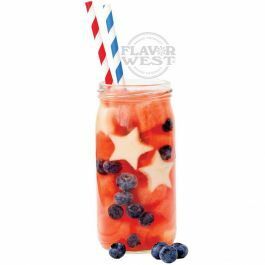 Red White and Blue flavor is a blend of Starfruit, Blackberry, Strawberry perfectly mixed to create a sweet, delicious and aromatic flavoring. Type: Red White and Blue Water Soluble Flavoring. Ingredients: Natural and Artificial Flavoring, Propylene Glycol and Ethanol. USP Kosher Grade Flavoring. Usage Rate: 15-20% for E-use. Flavor Suitability: Suitable for desserts, ice creams, pastries, candy, lip balm and more. Specific Gravity: 1.06 No Refunds on Flavoring. This has become an Instant Favorite in my Vape Shop! Thanks FW!! This is more than a pleasant flavor, it's a WOW flavor!d hats off to FW for this one, ohhh yeaaahhhh. This is a perfect blend, sweet, simple perfection. oh yes, it is that blue little thingy thing. tastes like smurf... looks like a smurf, and of course.... it is a smurf! if you have ever vaped papa smurf... this is for you! the first time i vaped it, i´ve given standing ovations to flavor west.